Summary: in this tutorial, you will learn about MySQL natural language full-text search by using the MATCH() and AGAINST() functions. In natural language full-text searches, MySQL looks for rows or documents that are relevant to the free-text natural human language query, for example, “How to use MySQL natural language full-text searches”. Relevance is a positive floating-point number. When the relevance is zero, it means that there is no similarity. MySQL computes the relevance based on various factors including the number of words in the document, the number of unique words in the document, the total number of words in the collection, and the number of documents (rows) that contain a particular word. To perform natural language full-text searches, you use MATCH() and AGAINST() functions. The MATCH() function specifies the column where you want to search and the AGAINST() function determines the search expression to be used. 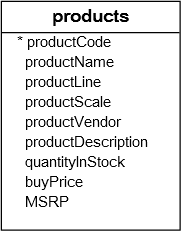 We will use the products table in the sample database for the demonstration. The AGAINST() function uses IN NATURAL LANGUAGE MODE search modifier by default therefore you can omit it in the query. There are other search modifiers e.g., IN BOOLEAN MODE for Boolean text searches. By default, MySQL performs searches in the case-insensitive fashion. However, you can instruct MySQL to perform case-sensitive searches using binary collation for indexed columns. A very important feature of full-text search is how MySQL ranks the rows in the result set based on their relevance. When the MATCH() function is used in the WHERE clause, MySQL returns the rows that are more relevant first. The following example shows you how MySQL sorts the result set by the relevance. First, you enable the full-text search feature for the productName column of the products table. The products, whose names contain both 1932 and Ford are returned first and then the products whose names contains the only Ford keyword. The minimum length of the search term defined in MySQL full-text search engine is 4. It means that if you search for the keyword whose length is less than 4 e.g., car, cat, etc., you will not get any results. In this tutorial, you have shown you how to use the MATCH() and AGAINST() functions to perform natural language searches in MySQL. Copyright © 2019 by www.mysqltutorial.org. All Rights Reserved.